The stem of this pipe is wrapped with turquoise suede leather and has two light brown rabbit fur wraps. It is also decorated with an abalone disc and has several real buffalo teeth. 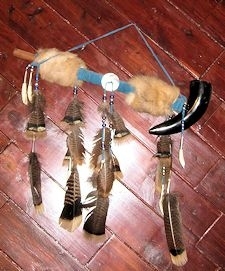 Each fringe has brass and glass crow beads and is tipped with a brass cone. Each set of two fringes also has a buffalo tooth. The fringes are decorated with rare bronze turkey feathers.